A century old methodology for deriving statistical distribution using approximate Stirling’s formulation of the factorial becomes questionable. By avoiding the use of exaggerated approximations, a new picture of the energy distribution of fermions and bosons are presented. Energy distribution among fermions (or bosons) in systems with finite degeneracy are found to be degeneracy dependent. The presented point of view explains, successfully, presence of degeneracy pressure in ultra-cooled Fermi gas and predicts the minimum accessible temperature for finite degeneracy fermions system. Energy distribution among limited number of particles with finite degeneracy was a confusing issue when dealing with nuclear reaction/interaction. It is of the interest in pre-equilibrium reaction [1,2] in which low degeneracy states are occupied by finite number of excitons that exist together for very short time compared to the total reaction time; very long as compared to the nucleonnucleon interaction time. As a matter of quantum nature of physical system, non-degenerate and low degeneracy systems are considered finite; which means that systems from nuclei to nanoparticle are finite and their properties may be comparable. Credibility in the formulations for the asymptotic Maxwell-Boltzmann (MB), Fermi-Dirac (FD) and Bose-Einstein (BE) distribution functions guided the physicists through a century to great findings. However, modern science needs more precise expressions for these distributions [3-6]. In general, the current statistical description of the physical ensemble needs adjustment in order to follow proper justification of the definition of number and equivalence (or even non-equivalence) of a priori probabilities. One way to attain such objective is to avoid approximation. In the present work, more precise methodology is used to avoid usage of Stirling’s approximation that is used to derive the asymptotic MB, FD, and BE formulae. for fermions. Each of these summations represents a harmonic-number function of the form . Equations (15) and (16) are nonlinear functions of and are difficult to be solved analytically and graphical technique is used instead; the resultant distribution for fermions and bosons are given in Figure 1. It is known that the formal FD distribution is extending to very low energy without limit. Contradiction that may appear in the present fermions-distribution may be confusing. According to the results given in Figure 1(a), the fermions-distribution (as I shall call) is degeneracy dependent. In this fermions-distribution, there are bounds for the particle energy. Let us assign the high energy bound at and the low energy bound at . Some fermions low energy limits are given in Table 1 together with its associated 1-dimensional temperature in the unit of Fermi temperature. Table 1. The lower bound of accessible temperature for nondegenerate (gi = 1) and low degeneracy Fermi gas. Here is the degeneracy of the fermion state. D is the number of degree of freedoms in which the measurements are taken in and (Expec.) = 2 .
means of high magnetic field is usually done. Fermions are atoms with odd number of neutrons like 6Li and 40K while bosons are atoms with even number of neutrons like 7Li, 23Na, and 87Rb. The degeneracy pressure prevents cooling of the fermion gas to temperature less than certain value, say in present case. Two main techniques had been used to determine the temperature; the first is the optical density for specific wavelengths absorbed through the gas cloud [15-18] which measure the one-dimensional kinetic energy, . The second technique uses spatial dimension of the cloud shadows [19,20] which measure the two-dimensional kinetic energy, . The high magnetic field ensures the non-degeneracy of these states, i.e. . According to my results, the lowest temperature for non-degenerate Fermi gas should be in one-dimensions which is equivalent to in two dimensions. 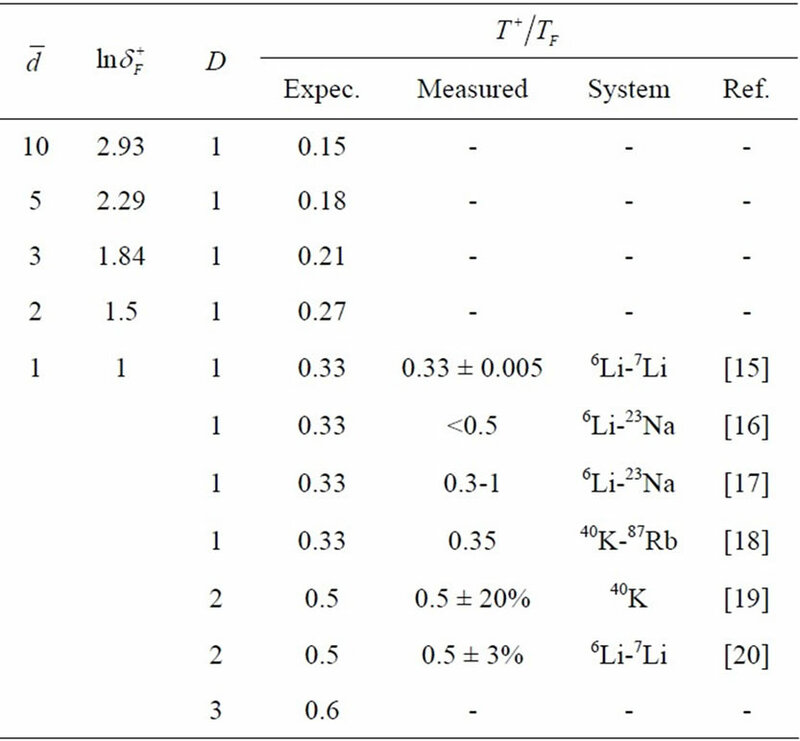 These result are exactly the minimum temperature ever reached until now for non-degenerate Fermi gas, see Table 1 for comparison with experimental results. Similar degeneracy effect is apparent for the bosonsdistribution (as I shall call) as shown in Figure 1(b). 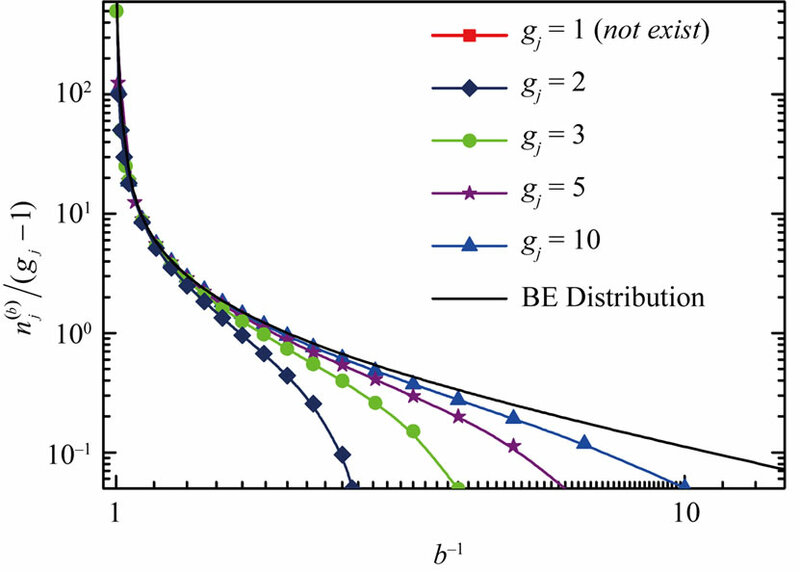 At very low energy, the bosons-distribution coincide with the BE-distribution. Experimental evidence for the absence of low energy bound is observed during synpathetic cooling of fermions and bosons mixture. Truscott et al. give definite evidence that continues to cool down. There is a certain high-energy limit for the bosons-distribution (no-solution could be found for Equations (15) and (16)), typically at . The high energy limit of the of the bosons-distribution ( ) may give attributes of the “maximum” accessible energy for the bosons in the system. Figure 1. Connected symbols refer to graphical solutions of Equations (15) and (16) (a) for fermions and (b) for bosons; while for the FD and BE distributions are represented by solid line without symbols. In part (a), the intersections with the horizontal axis at and 1 give the reciprocal values of and , respectively. In part (b) the intersection with the horizontal axis in which (not shown in logarithmic scale) gives the reciprocal value of . which satisfies the equality . As the value of increases, the value of increases. 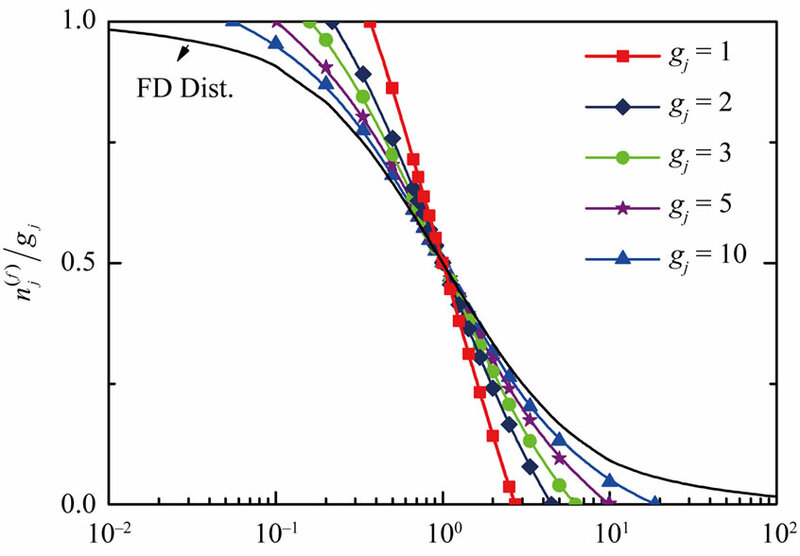 Hence, highly degenerate Fermi system should follow FD distribution. The applicability of the formal FD and BE statistical distributions become questionable in finite systems of small degeneracy in spite of its success in describing common physical system. More precise quantum distribution functions need to be used if the degeneracy of the state of the system is low. If a system of fermions gas is considered, there is a minimum temperature limit that the system cannot encroach upon, without violation of Pauli Exclusion Principle. A. Isihara, “Statistical Physics,” Academic Press, New York, 1971. C. Tsallis and U. Tirnakli, “Nonadditive Entropy and Nonextensive Statistical Mechanics—Some Central Concepts and Recent Applications,” Journal of Physics: Conference Series, Vol. 201, No. 1, 2010, Article ID 012001. B.-N. Guo and F. Qi, “Sharp Bounds for Harmonic Numbers,” Applied Mathematics and Computing, 2011, Article in Press.